I have clear memories of my mom baking Spritz Cookies when my sisters and I were little. We’d help with the sprinkles, which I always thought was the best part of the process until I finally tried my hand at squirting out dough through the press last week. Now that’s fun! If you’re not familiar with Spritz Cookies, they’re a classic butter cookie that originated in Germany (known as Spritzgebäck). You extrude the dough through a cookie press (I received this Kuhn Rikon cookie press as a Christmas gift a few years ago). The cookie press instructions advise you to kind of move quickly – just squirt out one cookie after another on your cold baking sheet. 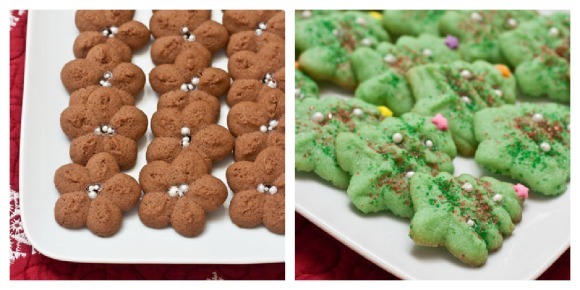 Blurp…blurp…blurp…before I knew it I had a whole pan of cute little trees ready to go in the oven. You can’t see it in the photos, but there’s actually a bit of cardamom in the vanilla cookie recipe that adds a subtle warmth to the overall flavor – I loved it. After spritzing out several dozen trees – the recipe makes quite a lot – I went ahead and made a bunch of chocolate poinsettias (a bit of trivia – did you know that 70% of all domestic poinsettias come from Paul Ecke Ranch, right here in San Diego?). The best part about spritzing out holiday cookies is the chance to share them with friends. 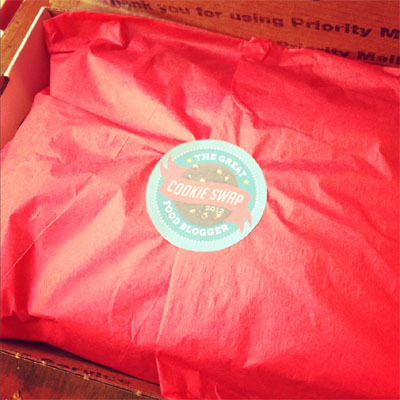 I was excited to participate again this year in The Great Food Blogger Cookie Swap – an annual virtual event organized by Julie of The Little Kitchen and Lindsay of Love & Olive Oil in which more than 500 food bloggers from around the country exchange homemade cookies and holiday cheer. This year, through donations from the participants, the event also raised more than $4,400 for Cookies for Kids’ Cancer. It’s an all-around wonderful endeavor. 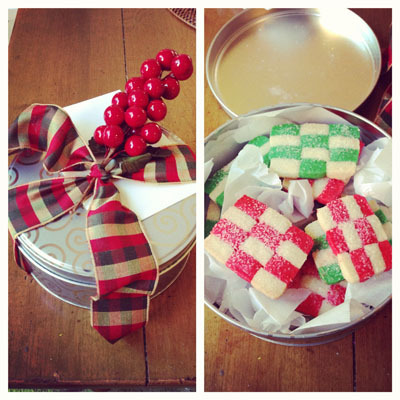 Holiday Checkerboard Cookies from Lisa at Authentic Suburban Gourmet – beautiful cookies AND extra nice packaging! My daughter enjoyed eating these buttery little checkerboards row by row. Shortbread Cookie Sandwiches with Caramel Chocolate Ganache and Smoked Almonds from Amanda at High Heels to Hot Wheels – my kids could not keep their hands out of this fabulously decadent cookie tower! 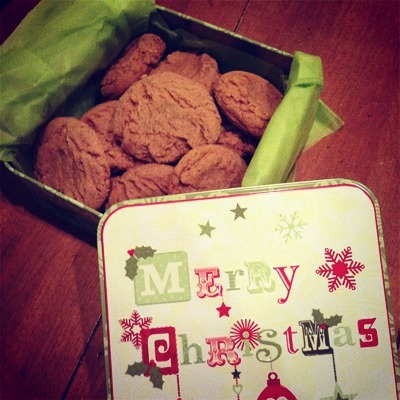 Spiced Rum Cookies from Jessica at My Baking Heart – crisp and loaded with the flavor of brown sugar, spices and rum. I’ve used the rum as an excuse to keep my kids out of this pretty tin and save these fabulous treats for myself! Thank you so much, Lisa, Amanda and Jessica! Be sure to visit their blogs for their cookie recipes. Below is the one I followed for the Spritz Cookies, from the recipe booklet that came with the cookie press. 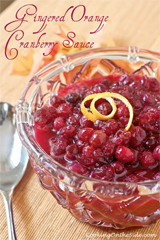 Combine the butter and granulated sugar in a large bowl. Using an electric mixer set on medium speed, beat until light and fluffy. Beat in the egg, vanilla extract, cardamom and salt. Using a spoon, stir in the flour until well mixed. Pack the dough into the cookie press. Fit with the desired disk design. Press the dough out onto ungreased baking sheet spacing the cookies 1 inch apart. Bake until lightly golden, about 10-12 minutes. Gently transfer the cookies to wire racks to cool. 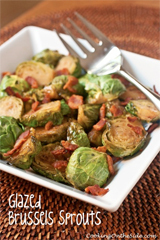 Sprinkle with vanilla sugar, if desired, or decorate with colored sugars. 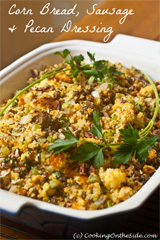 Store in an airtight container at room temperature for up to 4 days. For chocolate cookies: Replace the cardamom with 2 tablespoons of milk, and add 1/4 cup of unsweetened cocoa powder along with the all-purpose flour. 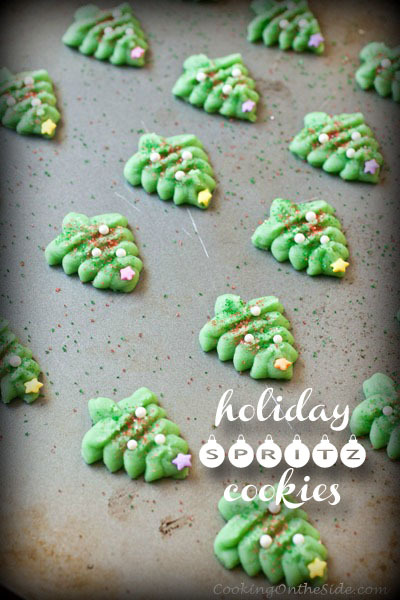 These spritz cookies were delicious! I could taste the cardamom, but couldn’t figure out what it was- nice twist on the spritz cookies I’d been familiar with. And you can never go wrong with chocolate! Thanks for sharing! 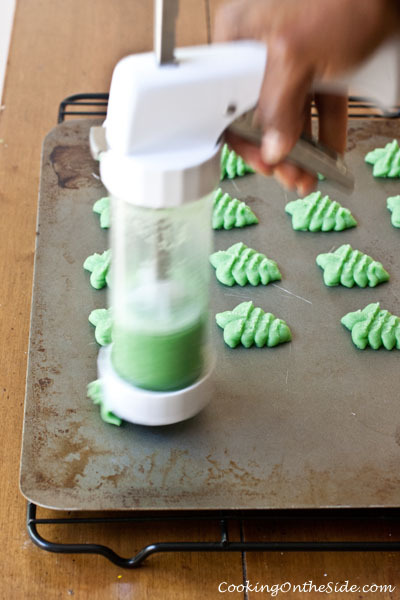 I’ve always wanted one of those cookie presses, they make the most perfect little cookies. 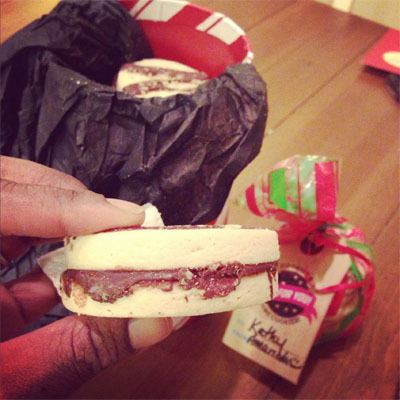 Kathy – so happy that you and your daughter enjoyed the cookies! LIke you, I have very fond memories of Spritz cookies. They are my hubby’s favorite cookies. Love your cover photo. Hope you and your family have a great holiday season!! Ooo, I always love playing with the cookie press!